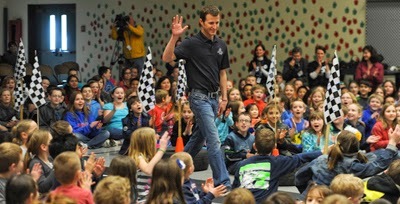 Kasey Visits Southwood Elementary in Enumclaw, Washington. 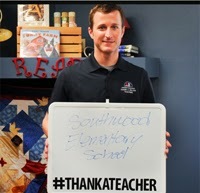 As part of the Farmers Insurance “Thank A Million Teachers” national initiative, Kasey Kahne visited his childhood school Southwood Elementary today and honored former Principal Jake Thomas and fourth-grade teacher Jody Emerson with a heartfelt “Thank You” in front of hundreds of excited students. During the visit, Farmers Insurance and Kahne surprised Thomas and Emerson by inviting them to be Kahne’s guests at the Sunday, May 4 NASCAR Sprint Cup Series race at Talladega (Ala.) Superspeedway. Thomas and Emerson will get behind-the-scenes access and get an insider’s view of Kahne in his unique and highly-competitive work environment. Also during Thursday’s visit to Southwood, Farmers Insurance and the Kasey Kahne Foundation announced matching donations to the school to help fulfill the students’ dream of planting a reading garden. As a result of the donations, the garden will be named the Kasey Kahne Reading Garden planted by Farmers Insurance. With nearly 300,000 teachers across the United States already recognized since the “Thank A Million Teachers” campaign was launched just a few short weeks ago, Farmers Insurance is far ahead of its stated goal to Thank a Million Teachers in 2014, the insurer announced last week. As part of the “Thank A Million Teachers” initiative, Farmers has been urging America to thank teachers, past and present, for the positive impact they have had in communities across the nation. Farmers has invited teachers to submit proposals for $2,500 grants on the www.ThankAMillionTeachers.com website. During March, Farmers is inviting the public to vote on the proposals, with 30 winners to be announced in April. In all, Farmers has committed to donating $1 million to teachers and education programs in 2014. Re-Visiting #NASCAR’s Once Upon A Time!